Vegetables are an important part of a healthy diet, especially when eaten immediately after harvest. The longer vegetables sit on store shelves or in your refrigerator, the more vitamins and minerals they lose. Vegetables also lose nutrients during the cooking process, especially when tossed into a pot of boiling water. Boiling is one of the most common methods used to prepare vegetables. The problem is that vitamins, especially vitamins B and C, dissolve in water, according to Health Services at Columbia. As the water bubbles away, it strips vegetables of precious nutrients. The longer the vegetables sit in the hot water, the more nutrients they lose. Because these nutrients leach into the water, you are not receiving all of the dietary benefits the vegetables have to offer. 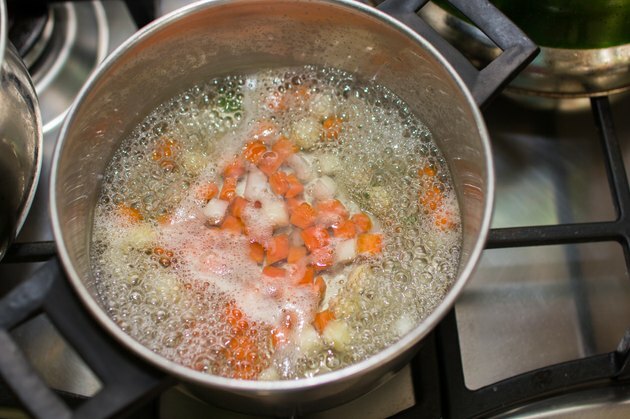 If you must boil your vegetables, do so in a manner that causes the least amount of leaching. Bring water to a boil over high heat before adding the vegetables. Once the water boils, turn the heat down to low. Add the vegetables and allow the water to simmer until the vegetables are tender. The University of Kentucky Cooperative Extension explains that simmering water over low heat produces less agitation than boiling over high heat. This means that tender vegetables remain intact and fewer nutrients are lost. Do not let all of that nutrient-rich water go to waste after your vegetables boil. Instead, the Harvard Medical School Family Health Guide suggests salvaging the water after draining the vegetables. Pour the water into a plastic storage container and use it for soups, sauces or your favorite gravy recipe. If you are not going to use the water right away, cover the container and place it in the refrigerator until you need it. Just as fresh vegetables lose their nutrient content over time, so will the nutrient-rich vegetable water. Left to stand at room temperature, light and oxygen will eventually cause evaporation of the water and the dissipation of the dissolved vitamins. Storing the vegetable water in the refrigerator prolongs nutrient retention. According to the University of Florida IFAS Extension, for maximum nutrition, use refrigerated vegetable stock within a few days. Otherwise, freeze the vegetable water to preserve nutrients for a longer period of time. If cooking healthy and making sure your vegetables maintain their nutritional value is top on your priority list, you may want to skip boiling altogether. In a Chinese study that involved different cooking methods and broccoli, steaming came out on top. According to the study led by Gao-feng Yuan at Zhejiang University's Department of Horticulture, compared to microwaving, boiling and stir frying, steaming produced the least amount of vitamin C, chlorophyll, glucosinolate and protein loss. Health Services at Columbia: Go Ask Alice: Cooking Veggies and Vitamin Loss? University of Kentucky Cooperative Extension; Vegetable Preparation for the Family; Sandra Bastin, Ph.D., R.D., L.D.